You might have to navigate a photo shoot. Two Instamodel bros in Versace are blocking the Millennial pink and gold staircase of Cheek when we arrive. It's the kind of restaurant where being seen and nailing the shot is probably as important as the food. This is venue two from the team behind Preston's Dexter, where the tagline is meat, buns 'n booze and signatures include picklebacks (a whiskey nip chased with pickle brine) and meat donuts [sic]. The vibe in general is "don't take it too seriously". This is pitched as a step up from Preston and a few things argue that case. 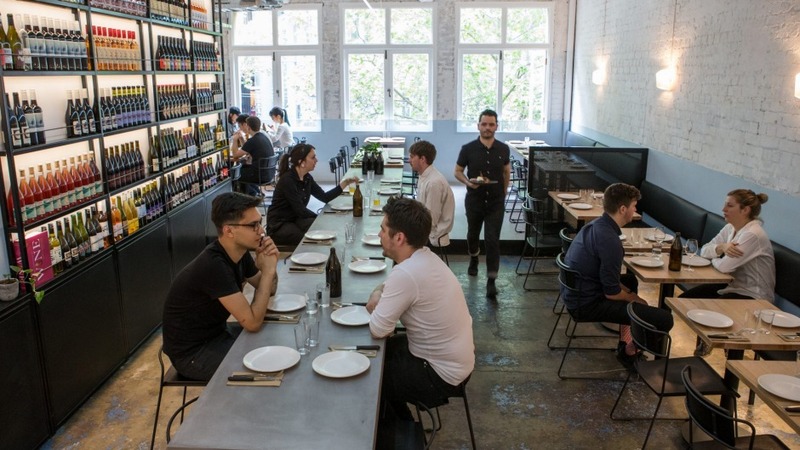 The wine list (aka, "hand-picked condiments to be paired with meat") is more extensive, with a couple of Italian and French options, though it's still hailing bold, acidic and generally off-piste stuff from winemakers such as Pat Sullivan, Xavier Goodridge and Arfion. Beers on tap are from Preston. In bottles and cans they're Japanese, Korean and cool stuff from Ballarat. Absolutely everything is right now, right on. Ambient electronic beats bounce off a room that's whitewashed, well lit and minimalist, with black vinyl banquettes along the walls and a big hunk of smooth concrete for group dining, butchery or human sacrifice down the middle. There are straws but at least they're paper. The food is barbecue. Roughly. If squinted at through mod-everything glasses it's barbecue that appropriates elements from everywhere else. There are prawn crackers dusted in smoky barbecue salt, a tartare with Korean pickle, mapo tofu empanadas with a tonkatsu-style bulldog sauce. A good third of the menu is vegetarian and more than half is gluten-free. These are the plates of our lives. The team is attentive and keen to show you a good time, and the room is buzzy, especially now spring is heating up and the breeze blows in through excellent haircuts via the big industrial windows. But hot tip: Keep your culinary expectations dialled to free-wheeling. Flavour-wise at least, we're dealing with a Baz Luhrmann level of subtlety. Excellently crisp prawn crackers with smoky dust are innocuous enough and gone in a snap. But then, it's on. That Japanese-Chinese-South American empanada filling of aged pork mince and firm tofu is lost to the buttery pastry and bulldog sauce, which is as intensely herbal and medicinal as Fernet Branca. The plum tartare isn't. 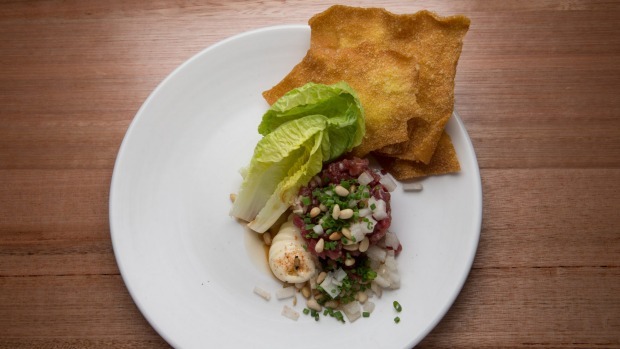 Instead it's a medley of rough-cut beef, pickled nashi pear and pinenuts whose main and lasting flavour is sesame oil. Best and brightest on field goes to eggplant smoked down to caviar, lifted with a spicy, vinegary dressing and thatches of fresh coriander, to scoop up with (slightly squeaky) roti. Beyond, brace your taste buds. And your girdle. The menu has started as it means to go on in a salty, saucy, high-octane ride of grilled and smoked and dry-aged meats. Every one of them is a week at the gym on a plate and a gallon of water or beer on the side. A solid inch of cured bacon topped with a lacy fried egg might be a special. 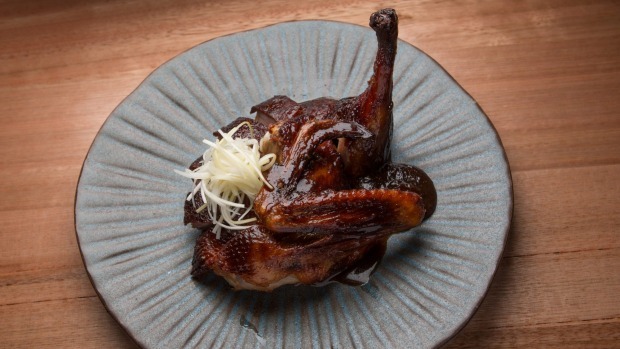 Dry-aged duck, cleaved into snappy-skinned sections, is pink fleshed but paired with smoked hoisin and leeks that seem to add more salt than contrast. The Dexter import of a well-marbled wobbly rib-eye is good, as is the texture of bone marrow mash, but again, the gravy seems to have had a heavy slip of the shaker. Order as wisely and as lightly as possible. That means yes to the stack of crisp cos leaves, even if the caesar dressing is cheesy. It's also a thumbs up to sweet beets and tart buttermilk. Fresh. 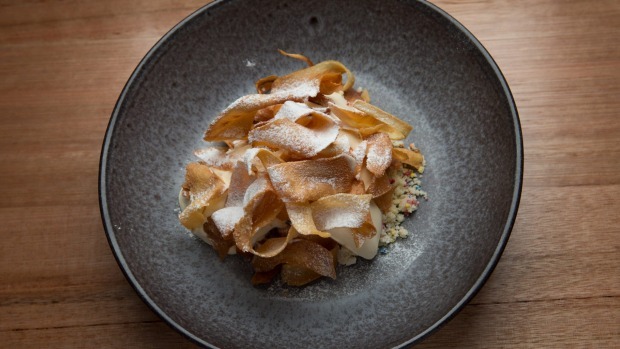 It's a think twice to the intensely creamy, barely frozen brioche ice-cream topped with fried parsnip curls. Oof. Then again, if you're here expecting health or the high end of dining, you're barking up the wrong glowing staircase. Accept the cheeky apple pie moonshine shot as a parting gesture, take your selfie on the stairs and consider this part of your so-hot-right-now list ticked. Pro Tip: An upstairs bar is coming soon. Go-to Dish: Bacon and egg rib, $19.